Oh, what fun I had last Sunday at the National Museum of Women in the Arts. 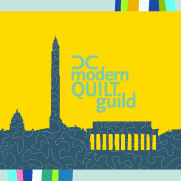 The museum had invited the DC Modern Quilt Guild to come and demonstrate hand work in the gallery, amongst their exhibit of gorgeous antique quilts. We sewed a little, we demonstrated a lot, we chatted with visitors almost constantly for the whole 5 hours. I even did a little repair on an antique quilt someone brought in. I couldn’t believe how fast the time went. If I could make a career of that I surely would! 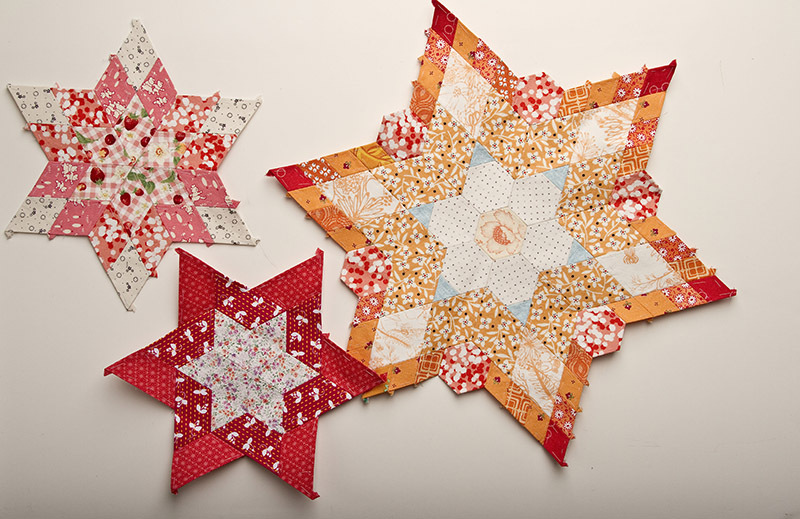 I brought along my English-paper-pieced baby quilt and made a little progress on the orange star. 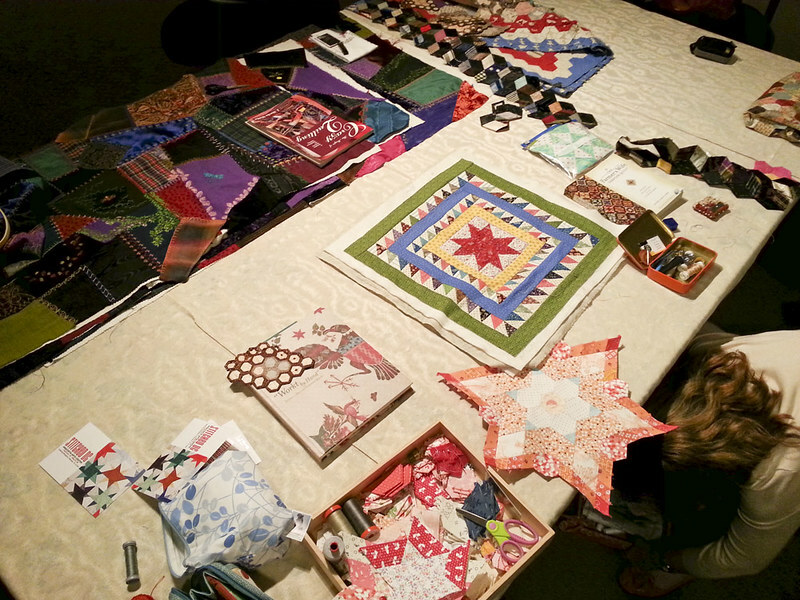 Other members brought along hand quilting, binding, more EPP, and embroidery. The table where we sat was such a joyful conglomeration of projects. Adding to the excitement of the day, my friend Mary Koval had lent me some examples of antique English paper piecing which were unfinished, and still had the papers inside. With templates cut by hand from old letters and receipts, the backs of these pieces were so fun to stare at. 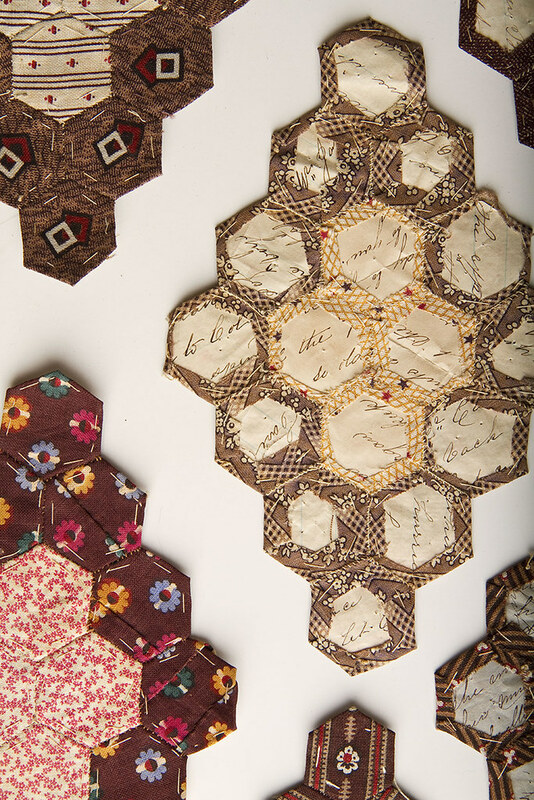 And the old fabrics… I could pore over these quilts all day and never tire of them. 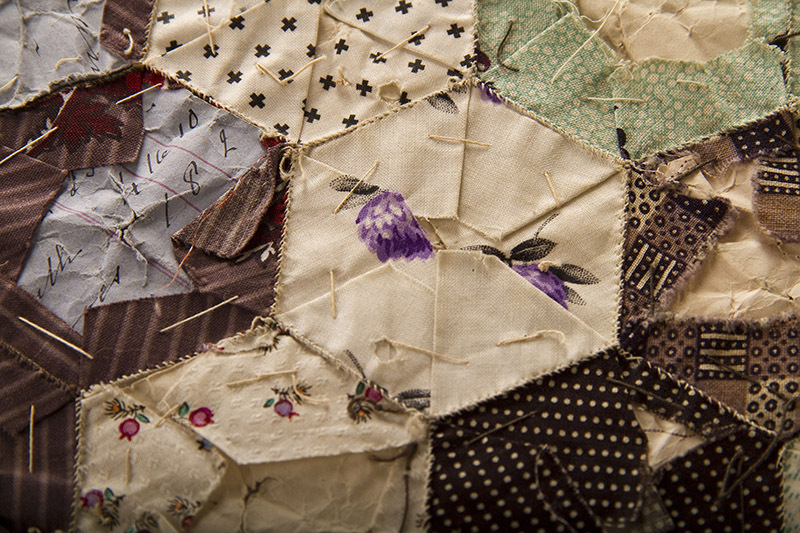 All that work, all the time spent by some unknown maker, it stays with the quilt long after the maker has passed. So lovely to behold. Sunday at the gallery, and later that night, I added a round of shapes to two of my stars- so I’m still at 3, but they are growing! Thanks for sharing the antique blocks, very interesting.. I would have loved to study them up close. I agree, your stars are beautiful. What a treasure those antique pieces are! So pretty! Love the red one! I *love* the NMWA! (My grad school research was on women artists in the 17th century, so how could I not?) How lucky you were to get to work there! And how wonderful is it that they have a quilt exhibit up! Wish I could get out to the east coast to see it. How wonderful! I love the historical aspect and oh to be able to see those unfinished pieces. It really makes you wonder if someday, someone, somewhere, will be looking at our unfinished work and wondering what about the person and the story behind the work. It makes me want to write a quick note about the work and throw it in the bag with it….just in case I leave it behind unfinished, it would provide some insight into the choices and intended use. Very cool! Thank you for sharing! Oh and love the addition to your stars.